Cashus farmed in Jefferson and Marion Counties and after his father’s death bought William Divine Claybourn‘s house and 80 acres of the homestead in 1897, living there with his family and farming until November 1901. Because of his wife’s health, he moved to Texas for a milder climate. The neighborhood village outside of Mt. Vernon, Illinois, where much of his family remained – Texico, Illinois – was actually named by Cashus. He used Tex for Texas where he had moved, the I for Illinois, the C for Claybourn, and O for Osborns, who owned the land on the south side of the road. The family lived at Trinity in east Texas where Cashus had 130 acres of pine timber and operated a lumber mill and later a livery business. He bought a bright red Pope-Hartford automobile in Palestine and had it shipped to Trinity (there were no roads to drive it on) where it was the first automobile in the town. In 1907 they moved to Palacios, Texas, where Cashus did rice farming and carpentry work. The Pope-Hartford was also the first auto in Palacios. Later he bought a Ford and used it as a taxi to transport people to nearby towns. In the latter part of his life he raised cattle. Like most of the Claybourns he was a small man with blue eyes and brown hair. Rose was a small woman with gray eyes and reddish blonde hair. She was always called “Dove.” She was a good cook and homemaker. Cashus belonged to the Modern Woodmen of America and she belonged to the women’s auxiliary. Cashus died on 13 December 1936 (note that he was born on the 13th, was the 13th child, and died on the 13th). Rose died on 2 November 1944. Both are buried in Palacios Cemetery beside their youngest son Forrest Clyde Claybourn. Herschel Claybourn was born on 26 June 1881 and died a few months later on 3 November of 1881. He is buried in Jordan Creek Cemetery in Jefferson County, Illinois. Ira Marshall Claybourn (click name for separate biographical sketch) was born on 1 October 1882 and died on 16 April 1967. Arthur Ellis Claybourn (click name for separate biographical sketch) was born on 4 February 1885 and died on 3 January 1941. 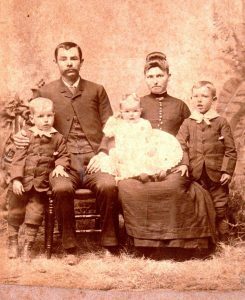 Verdie Cordelia Claybourn was born on 17 December 1887, in Centralia, Illinois. She attended the Baptist College of Music in Palacios, Texas. She married (1st) on 20 January 1907 to James Benjamin White. [James White was born on 9 March 1885 in Trinity, Texas.] Together they had two children, Coy and an infant daughter, listed below. 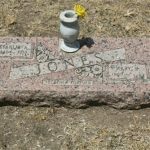 James died on 10 July 1910 in a railroad accident on the I.G.N.R.R., for which he worked, at Lovelady, Texas. Verdie married (2nd) at Montgomery, Alabama on 25 June 1912, to John Gordon Rives (“Jack”). [John Rives was born on 12 September 1891 to George M. Rives and Martha Hohni.] Together they had two children, Mattie and Verdie, listed below. He was a brakeman on the Southern Pacific Railroad but retired on 30 September 1958, after 30 years of continuous service. The couple lived at 707 North West Street in Victoria, Texas, and had a trailer and enjoyed fishing trips. Jack died on 4 March 1967. Verdie died on 24 July 1979 in Victoria, Texas. Jack and Verdie are buried in Evergreen Cemetery in Victoria County, Texas. Coy Hartwell White was born on 26 August 1908 in Palacios, Texas. He was a sports writer and worked for various newspapers in Beeville and Bryan, Texas. In about 1930 Coy married Mary Lucille Evans. [Mary Evans was born on 2 November 1910 in Coffeeville, Texas to Herbert and Gertrude Evans.] They had three children, listed below. Coy died on 22 July 1985 and Mary followed in December 1986. D’Anna Lou Bilby was born in 1959 in Brazos County, Texas. She married Steven Kelly Garrett (born 1961 in Wise County, Texas) on 4 April 1980 in Wise County. They had two children, Kristen Nicole Garrett (born in 1985) and Jason Paul Garrett (born in 1987). Jeffrey White Bilby was born in 1961 in Taylor County, Texas. He married Esther Marie Reisch, born in about 1963, on 20 July 1980 in Wise County, Texas. They had three sons: Nicholas Lee Bilby (born in 1982), Kyle Scott Bilby (born in 1984), and Ryan White Bilby (born in 1990). Scott Monroe Bilby was born in 1962 in Taylor County, Texas. Jackie Bert White was born on 16 April 1942 in Bee, Texas. She married James Hale Cashion (1938-2005) on 11 June 1967. They had two children. He died in Houston and is buried in Oaklawn Memorial Park Cemetery in Henderson County, Texas. Wendy Luann Cashion was born in 1971 in Harris County, Texas. James Hartwell Cashion was born in 1975 in Harris County, Texas. He married Jennifer S. Soliz on 13 March 2009 in Harris County, Texas. Patricia Ann White was born on 17 March 1947 in Bee County, Texas. She married Norman Kent Garrison (1945-2003) on 23 April 1966 in Harris County, Texas, and they divorced there on 10 July 1972. There are no Texas birth records for children from this marriage. An infant daughter was born and died 22 August 1910, just a little over a month after her father’s death. Martha Maurice Rives (“Mattie”) was born 1 October 1913 in Palacios, Texas. She graduated from the Texas Chiropractic College and practiced for a number of years. In World War II she was a Corporal in the Women’s Army Corps., and was in service from June of 1944 to July of 1945. She was in London during the Blitz and was injured. In 1959 she became a licensed vocational nurse and lived at in San Antonio, Texas and Victoria, Texas. However not much later on 27 June 1960 she was in an automobile accident resulting in a pulmonary infarction. This ultimately took her life on 9 August 1960. Verdie Irene Rives, called “Puggy” (Poogie), was born on 10 September 1915, in Palacios, Texas. She married on 1 June 1935 to Horace Dodson Carmichael (called “Dixie”). [Horace Carmichael was born on 1 October 1914 in Hillsboro, Texas.] He served in the military, including with the U.S. Air Force 20th Bomber Command in the Pacific Theater. Horace worked in a variety of roles for the Dallas Museum of Health and Science, most notably as Director and Director Emeritus. Verdie and Horace lived in Dallas and had two children, listed below. Puggy died on 1 March 1970. Thereafter Horace remarried to Irene Field Barns. He died on 8 August 2008. She is buried in Evergreen Cemetery in Victoria County, Texas. Horace Dodson Carmichael (“Mike”) was born on 9 March 1937, in Abilene, Texas. He studied business administration at the University of Texas and lived for a time in Erwin, California. He married Nancy Jane Mower, born in 1941 in Los Angeles, California, on 3 November 1972 in Orange County, California. Gordon Rives Carmichael was born on 11 December 1940 in Hempstead, Texas. He was a combat-decorated-for-valor, Purple Heart Vietnam War veteran and retired United States army career officer. Later he worked as an English professor. The hobby of travel was a passion since his youth. Besides circumnavigating the earth numerous times, he worked in the White House; swam in the mighty Mekong River in Vietnam; climbed the Great Pyramid of Khufu in Egypt; trekked the Rub al Khali in Saudi Arabia; ran with the bulls in Pamplona; railroaded the breadth of Russia, from Moscow to Vladivostok; canoed the Amazon in Brazil; scaled Ayers Rock in Australia; skied the Alps in Austria; kayaked the Nile in Egypt; reedboated across Lake Victoria, Africa; meditated at Pi Lin on Lantau Island in Hong Kong; hiked the Himalayas in Nepal; rendered offerings at the Cao Dai Holy See, Tay Ninh, Vietnam; hot-air ballooned over Paris and the Loire Valley in France and the Pyrenees Mountains in Spain; walked miles of the Great Wall in China; scuba dived the Red Sea in Ethiopia, the Great Barrier Reef in Australia, and myriad atolls in the Eastern Caroline Islands; and ritually cleansed in the Ganges in Uttarakhan. In 2011 he published a book, Captain’s Tutor, a novel of romance set in the Vietnam War. Mary Myrtle Claybourn was born on 27 July 1890 in Marion County, Illinois. She married Stanley Arthur Jones on 29 November 1908 and together they had three children, listed below. [Stanley Arthur Jones, Sr. was born on 25 January 1880 in Port Vincent, Louisiana to Charles Jones (1856-1904) and Ella Mae Hatchell (1859-1881).] Stanley was a stationary engineer at the ice plant in Palacios, Texas. He later worked for Southern Pacific as a water service mechanic and then retired in 1950. The two lived in San Antonio, Texas, beginning in 1918. Stanley died on 30 September 1957 and Mary followed on 2 August 1983. Both are buried at San Fernando Cemetery #3. Stanley Arthur Jones, Jr. (called “S.A.”) was born on 28 August 1909, in Palacios, Texas. He sold and repaired typewriters and adding machines. He married married (1st) to Agnes Beatrice Carrico (1911-1972). They had no children and divorced. He married (2nd) to Marian Lucille Scurlock (1913-2003) on 16 May 1935. Stanley died on 6 September 1975 in Pittsburg, Oklahoma. Marian died in 2003 in Jasper County, Texas, and is buried in Trout Creek Cemetery in Newton County, Texas. Roberta Gail “Bobbie” Jones was born 4 February 1939 in Houston, Texas, and married (1st) Louie A. Walston of San Antonio in about 1955. She married (2nd) John Tom Bryant (1923-2010) by 1970 and lived in Kirbyville, Texas. They had two daughters, but were no longer together at the time of his death as his obituary mentions the daughters but not their mother. John is buried in Trout Creek Cemetery in Newton County, Texas. Kimberly Gail Bryant was born in 1971 in Jasper County, Texas. She had a daughter, Kelsey Gail Bryant, in 1991. She married Robert Earl Hughey on 7 October 2000 in Orange County, Texas, and they divorced on 6 November 2006 in Jefferson County, Texas. They had one daughter, Brianna Hughey. Kristi Meshell Bryant was born on 24 May 1973 in Jasper County, Texas, and died there from an auto accident on 11 June 1992. 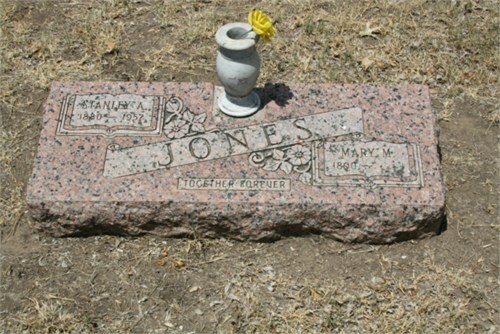 She is buried in Trout Creek Cemetery in Newton County, Texas. Stanley Arthur Jones III (“Sandy”) was born on 28 October 1943 in Victoria, Texas. He attended high school in Kirbyville, Texas. He served in the Marines and served in Vietnam. He married married Linda Carroll Kistler (born in 1949 in Jasper County, Texas) on 26 June 1969 in Harris County, Texas. They had four children and divorced on 2 October 1987 in Jasper County. Stanley Arthur Jones IV (called Stan) was born on 7 January 1972 in Alvin, Texas. He married (1st) to Carol M. Mahon (born in about 1971) on 5 July 2002 in Collin County, Texas, and they divorced on 11 May 2006 in Dallas County, Texas. He married (2nd) Tami Lyn Richardson of Jasper, Texas, and they had two sons, Thomas Arthur Jones (born on 7 February 2006 in Dallas, Texas) and Simon Andrew Jones (born 15 February 2011 in Houston, Texas). Lucinda Marie Jones was born on 8 January 1973 in Alvin, Texas. She married Steven J. Reed (born in about 1971) on 14 April 1995 in Nacogdoches County, Texas, and they divorced on 4 December 1998 in Jasper County, Texas. Forrest Andrew Jones was born on 20 November 1975 in Newton, Texas. He married Kristi Kay Hogan (born in 1979 in Jasper County, Texas) on 14 May 1995 in Jasper County. They had a son, Canan Andrew Jones, born on 7 October 1995 in Jasper County. Forrest and Kristiy divorced there on 19 June 1996. Thaddeus Claibourne Jones was born on 12 May 1978 in Jasper County, Texas. He married Megan Elise Barnett (born in 1985 in Jefferson County, Texas) on 8 July 2006 in Jefferson County and they divorced on 7 July 2010 in Hardin County, Texas. Thomas Clayburn Jones was born 10 July 1945 in Victoria, Texas. He served four years in the Navy on the USS England and served in Vietnam. He married Nancy Ruth Fowler (born in about 1952) on 6 April 1974 in Jasper County, Texas. They had two children, then divorced on 19 April 1996 in Jasper County. Brandi Deeann Jones was born in 1975 in Newton County, Texas. She married Kimble A. Morgan (born in about 1974) on 16 September 1995 in Jasper County, Texas. Blake Clayburn Jones was born in 1984 in Jefferson County, Texas. He married Katrina R. Ledford (born in 1975) on 25 June 2008 in Jasper County, Texas. Thelma Verdie Jones was born on 2 October 1910 in Palacios, Texas. She married Clarence Cullen Hardin on 11 May 1929. [Clarence Hardin was born on 28 February 1908 to Walter G. Hardin and Annie R. Goodman.] They lived their entire lives in San Antonio, Texas, and together they had two children, listed below. Clarence sold paint and wallpaper to contractors. Clarence died on 7 August 1972 (of myocardial infarction) and is buried in Mission Burial Park South in Bexar County, Texas. Thelma died on 6 December 1995. Clarence Cullen Hardin, Jr. was born on 16 January 1931 in San Antonio, Texas. He graduated from Harlendale High School in San Antonio in 1949 and attended Trinity University for one year. He enlisted in the Air Corps and served from 1950 to 1954 in the Azores and Japan focusing on radar and electronics. He received an honorable discharge and was awarded the National Defense Service Medal, Korean Service Medal, United Nations Service Medal, Good Conduct Medal, Airman First Class in July 1954, and was ECM Recon Equipment Operator of B50 SAC. Clarence enrolled in South Texas State Technical College (later Texas State), where he graduated in 1954 with a bachelor of science degree in music education and a minor in industrial arts. On 1 September 1955 he married Carolyn Marie Malone in San Antonio and they had three children, listed below. 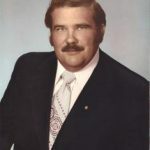 He became as Master Mason on November 1965 in El Campo Lodge # 918 A. F. & A. M. in El Campo, Texas, received Grand Cross of Color of The Order of the Rainbow for Girls in 1977, was elected Worshipful Master 1973-1974, District Deputy 1974-1975, 32nd degree District Grand Lodge of Texas, Master Mason instructor for 13 years, and received the Golden Trowel Award in 1979. In 1967 he became a member of the Order of the Eastern Star where he served as past Worthy Patron five times. Clarence taught band at Karnes City, Texas and in 1983 he received the outstanding Regional Industrial Arts Teacher of the Year by the Texas Industrial Arts Association, while teaching at Spring Branch I.S.D. The next year he received a master of science in occupational science from the University of Houston. He also had a good solo voice and was active in a capella choir and church choirs. In 1992 he retired from teaching and moved to Crockett, Texas. He was also a member of the American Legion and First United Methodist Church in Latexo. He died on 4 December 2013 in Crockett, Houston County, Texas. Clarence Cullen Hardin III was born on 4 July 1956 in San Marcos, Texas. He married (1st) to Judith Ann Thrift (1942-1995) on 2 October 1980 in Wharton County, Texas, and they divorced there on 10 March 1983. She had been previously married to Edmund Socha Jr. from 1966 to 1979 and they had a daughter, Amber Elizabeth, in 1965 and son, Shawn O’Dell, in 1966. Texas birth records show no children for Clarence and Judith. Clarence married (2nd) to Janet Lee Baklik (born in 1962 in Wharton County, Texas) on 7 November 1986 in Travis County, Texas. She had been previously married to Larry Glynn Seaman from 1980 to 1985 and had a daughter, Jennifer Marie, in 1981. Clarence and Janet had daughter Ashley Leeann in 1987 and she married Patrick R. Garcia on 13 July 2006 in Bell County, Texas. LaRae Marie Hardin was born on 15 June 1957 in San Antonio, Texas. She graduated from El Campo High School (1975) and the University of Houston (1983) and later worked in the United States Army. She married John Kenneth Park and they had a son, John Claud, in 1994 and another son, Thomas Reed, in 1996. Michael Christopher Hardin was born on 16 July 1959 in San Antonio, Texas. He was married to Jennifer Unknown as of his father’s death. Stephen Clay Hardin was born in 1961 in Webb County, Texas. He married Irma Virginia Vanek (born in 1962 in Jackson County, Texas) on 10 July 1982 in Jackson County, Texas. They had daughter Nicole Taylor in 1997 in Houston County, Texas. Donald Claybourn Hardin was born on 7 September 1939. He attended San Marcos State Teacher’s College in San Marcos, Texas, and married Patsy Marie Artz (born in 1940 in Travis County, Texas) in about 1965. Donald started his career with Northside Independent School District (“NISD”) in 1962 and retired after forty-one years of service in 2003. Upon his retirement, NISD honored him by renaming the Northside Athletic Complex to the Don Hardin Athletic Complex. He was also inducted into the Harlandale Hall of Fame in 2005. Donald and Patsy had two children, Donna and Darren. Donald died on 27 October 2013 in San Antonio, Texas. Donna Lynn Hardin was born in 1966 in Bexar County, Texas. She married (1st) to Michael Anthony Perez (born in 1967 in Bexar County, Texas) on 28 November 1987 in Bexar County. They had daughter Brittany Leeann in 1989, daughter Shelby Renee in 1991, and son Nathan in 1995. Donna married (2nd) to Timothy E. Barnhart (born in about 1959) on 10 June 2008 in Guadalupe County, Texas. Darren Alan Hardin was born in 1968 in Bexar County, Texas. He married Zandra Liane Celis (born in 1969 in Bexar County, Texas) on 8 January 1994 in Bexar County, Texas. They had daughter Alexandria Tate in 1996 in Bexar County. Forrest Claybourn Jones was born 17 May 1913 in Palacios, Texas. He was injured and died as a result of a car accident on 14 November 1940 in San Antonio. Prior to his death he married Adelle Marshall of San Antonio; the two had no children. Forrest is buried in San Fernando Cemetery #3 in Bexar County, Texas. Earnest Theodore Claybourn (click name for separate biographical sketch) was born on 23 May 1893 and died on 12 June 1961. Guy Raymond Claybourn (click name for separate biographical sketch) was born on 20 August 1897 and died in 1963. Glenn Dale Claybourn Sr. (originally named Glendale Divine) was born on 24 November 1900 in Texico, Illinois in the Claybourn homestead. He enlisted in the U.S. Army in November 1918, but the armistice was signed about six days later. He owned a filling station and garage in Palacios, Texas. He served as mayor of Palacios for two years and was a Past Master of #990 Lodge A.F.&A.M. He later owned and operated a motel called Glendale Courts in Palacios, facing the Bay. He married on 3 July 1921 to Clara Law Hastings. [Clara Hastings was born on 17 April 1902 in Florence, Alabama to Rufus and Ruby Redmon.] Together they had two children, listed below. Clara taught school before marriage and did substitute teaching in Palacios. Glenn died on 30 March 1972 in Victoria, Texas. Clara died on 26 November 1989. They are buried in Palacios Cemetery in Matagorda County, Texas. Glenn Dale Claybourn, Jr. (called “Popsy” or “Bubba”) was born 11 October 1923 in Dallas, Texas. He served in World War II from 27 January 1943 to 13 Septembr 1945 serving in the 2nd Armored Division 41st Armored Infantry, Company F. He was wounded in the arm on 6 October 1944 in Aachen, Germany. Glenn married on 30 April 1944 to Gladys Dell Davidson (called “Mopsy”) and they had one child, listed below. [Gladys Davidson was born on 28 May 1925 in Tyler to Carl and Ruth Davidson of Tyler, Texas.] Eventually Glenn went to work with the Houston Natural Gas Co. in Palacios, Texas. They lived in a number of Texas communities, including Palacios, Beeville, Dickinson, Victoria, Wimberley, and Kemah. Gladys died on 22 February 2008. Glenn died on 23 June 2011. Jan Ellen Claybourn was born on 18 October 1947 in Palacios, Texas. She married Richard Lee Alexander Jr. of Dickinson, Texas, on 3 February 1968 in Galveston County, Texas. They had two children, listed below. Samantha Sue Alexander was born on 27 June 1968 in Galveston County, Texas. She married Aaron Lee Mears (born in 1967 in Galveston, Texas) on 3 June 1995. Samantha and Aaron had two children, Reagan Nichole Mears and Alexander Jordan Mears. Dona Lynn Alexander was born on 8 July 1971 in Galveston County, Texas. She married Corey Daniel Rowe (born in about 1977) on 2 December 2007 in Galveston County, Texas. Dona and Corey had a daughter, Gracelynn Mae Rowe. Evelyn Irene Claybourn was born on 16 December 1924 in Dallas, Texas. Evelyn went by her middle name of Irene, but was often called “Buffy” by her grandchildren and many friends and neighbors. She graduated from Palacios High School in 1942. She married on 21 December 1945 to Reginald Glenn Buffaloe (“Glenn”) of Palacios, Texas, and they had two children. [Reginald Buffaloe was born on 17 September 1923.] Glenn served in World War II. Irene and Glenn moved to Houston, Texas, in 1962 and the two lived there for the rest of their lives. Irene worked for many years for the Houston Independent School District in the district office, then later for Heights Savings and Loan. But throughout her employment she also helped Glenn to build their family floor covering business, which they worked tirelessly to build and is continued into its third generation. In her spare time, Irene loved working in the yard and shopping. But her favorite pastime was her weekly poker game with her dear friends that took place every Tuesday for 28 years. She loved attending her grandchildren’s and great grandchildren’s athletic events and activities. Glenn died on 7 January 2003 and Irene died on 18 October 2010. They are buried in Memorial Oaks Cemetery in Harris County, Texas. Renie Lynn Buffaloe was born on 31 July 1952 in Newton, Texas. She married Jeffrey Larry Kristynik (born in 1953 in Harris County, Texas) on 8 June 1974 in Harris County. Jeffrey Kurt Kristynik was born on 19 June 1978 in Harris County, Texas. He married Marti Elizabeth MacPherson on 2 August 2003 in Harris County. Glenn Kyle Kristynik was born in 1981 in Harris County, Texas. He married Tiffany Nicole Roberts on 2 June 2009 in Harris County, Texas. Lynn Cole Kristynik was born in 1984 in Harris County, Texas. He married Whitney Leigh Donaldson on 13 March 2010 in Harris County. Denie Dale Buffaloe was born on 2 August 1956 in Bay City, Texas. She attended the University of Texas at Austin. She married (1st) to Gary Randall Dishongh (born in 1955 in Harris County, Texas) on 28 May 1977 in Harris County and they divorced on 8 February 1980 in Travis County, Texas. Texas birth records show no children for them. Denie married (2nd) on 1 July 1982 to Hugh Kenneth “Ken” Lunsmann (born in 1947 in Lavaca County, Texas) who was previously married with no children. Leslie Kandale Lunsmann (female) was born in 1984 in Harris County, Texas. Lyndsay Karin Lunsmann (female) was born in 1987 in Harris County, Texas. Forrest Clyde Claybourn was born June 5, 1903 in Trinity, Texas. He was burned in a stove explosion and died as a result of burns on December 15, 1909. His sister Myrtle pulled him from the burning kitchen.